The Bochur presented his chicken and said “I want to give you two manos with this chicken…. a Schnitzel, and a Pulka (drumstick)”. He may be a bachur but he’s for sure not a top bachur. You don’t give raw food for mm. The Rav doesn’t look amused. 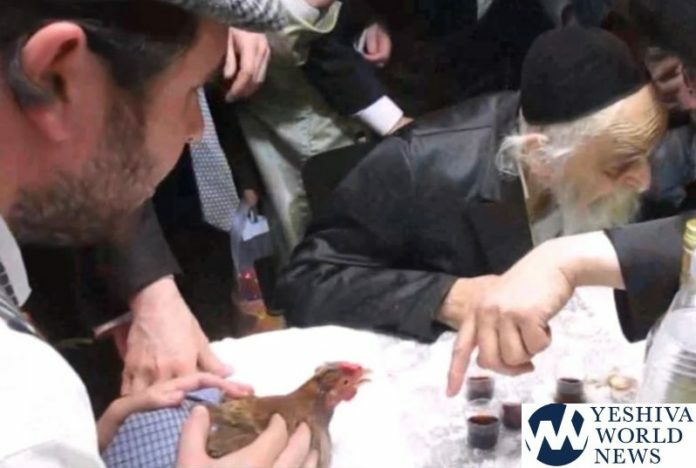 He tells him to take the chicken to the shochet. Started him out in the right direction, didn’t feel the need to waste his time on this ignoramus telling him to salt the meat, rinse it and roast it. this mechutzaf needs to be thrown out of the yeshiva. The rosh Yeshiva doesnt even want to look at him. Why was there no b’samim? At the end of the video, there’s a clip of the Rosh Yeshiva making havdala. He seems to skip besamim. Anyone have an explanation? The Havdala at the end should not have been put in without explanation. I know that the Chofetz Chaim did not say a bracha on besamim as he felt that he did not have a great enjoyment from smelling spices. (Possibly he considered this to be a general truth for the average individual, though this is not found in Mishna Brurah). It is possible that The Rosh Yeshiva shlita is of the same opinion or has a different reason for skipping the bracha. Either way this should be pointed out , so that no one should either think the Rosh Yeshiva forgot besamim, or start skipping it themselves. Many people when they are older lose their sense of smell and therefore do not make the Besamim as it is l’Vatalah. Two others who do not make the Berachah for this reason are R’ Tzvi Kushelevsky and R’ Dovid’s b.i.l., R’ Moshe Shternbuch. Why can’t they make the brocha on b’somim for the others listening? The Rosh Hayeshiva can not make the brocho for others because it is l’chora a bircas henenim and the mevorech has to be nehene himself in order to be motzie. I am not mochel YWN for the minutes wasted watching this rubbish, that i will never recover. What an embarressment that 1: we have such morons among us, and 2: that anyone thinks that there is another Jew that would desire to waste his G-d given time watching such stupidity. Thanks for the upload ! May Rav Dovid Shlita be Gezunt ad 120!! Rabbosai, it was Purim. The bochor correctly fulfilled ad dlo yoda. The rosh yeshiva was having a blast! That’s the version of a Brisker Purim. He said bring him to the shochet, as a joke, in order to m’kayem shaloch manos. The bochur asked him to make him a shliach to go to the shochet so that the shochet would do it for him. If you don’t understand a bissel yiddish or a bissel Brisk, don’t comment. This video is really great.